Even though there is snow on the ground here in Pennsylvania, I’m here today to share my 2018 Spring home tour. This weeks’ home tours, hosting by Marty of A Stroll Thru Life have been full of spring inspiration. If you missed any of the tours, you can see the entire list at the end of this post with links to visit each one! If you are here visiting from Thistlewood Farm, welcome! 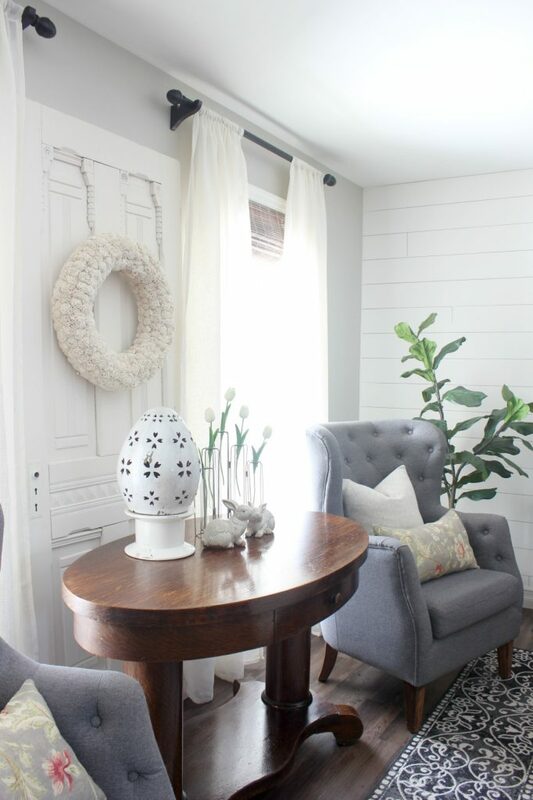 KariAnne is one of my all time favorite bloggers and her new Texas home is just amazing! 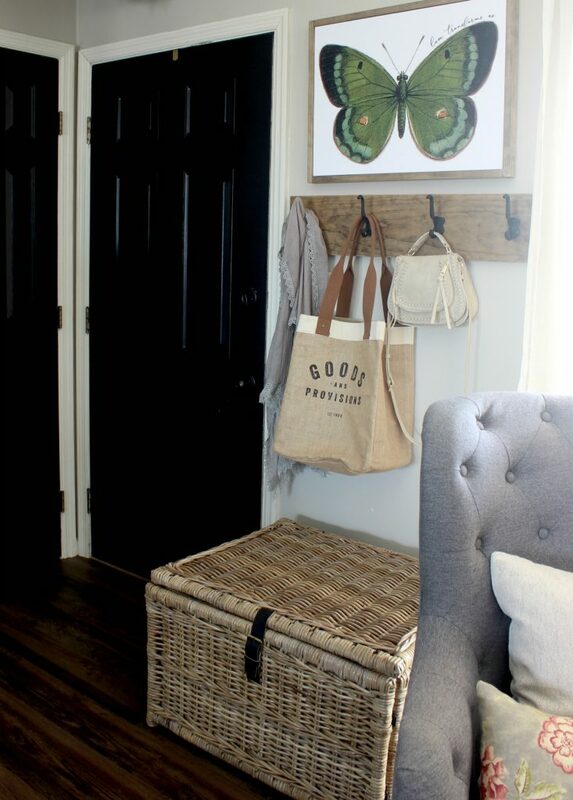 I have loved seeing her add that signature Thistlewood touch to each space! We’ll start today’s tour in the living room. If you follow me, you know that I recently took on the rather daunting project of reupholstering a French Bergere sofa that I found on Craigslist. Here is the finished sofa and I’m so happy that I did it! You can see a before shot of the sofa HERE. And, to hear all about the reupholstery process, click HERE. 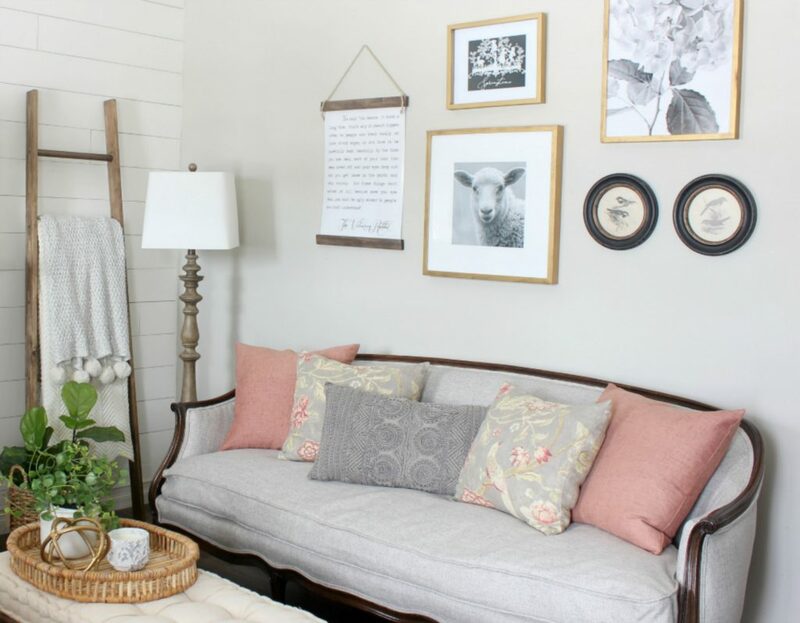 Behind the sofa is a little spring gallery wall that I created. I’m looking for a special piece for this wall space and I just haven’t found it yet. So, in the meantime, it’s fun to create expensive wall decor with some downloadable art from Etsy. Here’s a look at my mantel. I really wanted to have fresh flowers for the mantel, but mother nature had other plans with a spring snowstorm! So, faux flowers it is! Faux flowers and greenery have come such a long way and even Pottery Barn is featuring a larger selection of faux flowers this year! I changed up my living room curtains with these gauzy off white panels. The off white really warms up the mostly gray and white space. I also added some off white accessories, like this dried shola wreath. 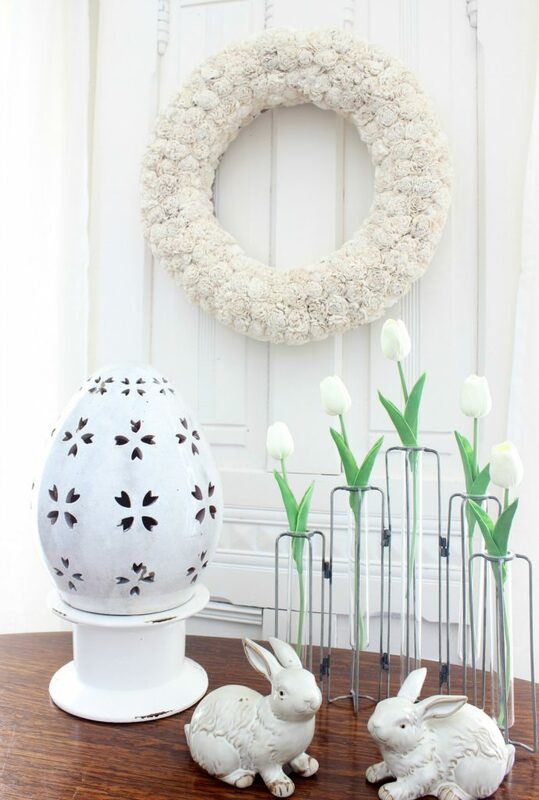 This great cutwork ceramic egg is from Pottery Barn. I got it several years ago and they actually brought them back last year. It’s one piece of Easter decor that I use every year! I purchased this amazing wicker trunk for another space and it just didn’t work out there as planned. So, I moved it here to the entryway for now. 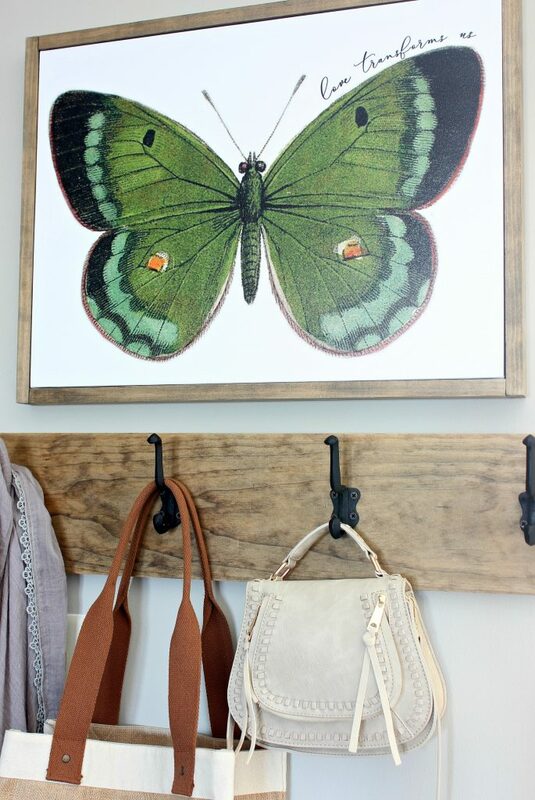 The butterfly artwork is something I created for Spring to sell in my Etsy shop. I’ll be launching an entire butterfly collection next week, so stay tuned. Here’s a closer look at the canvas print. 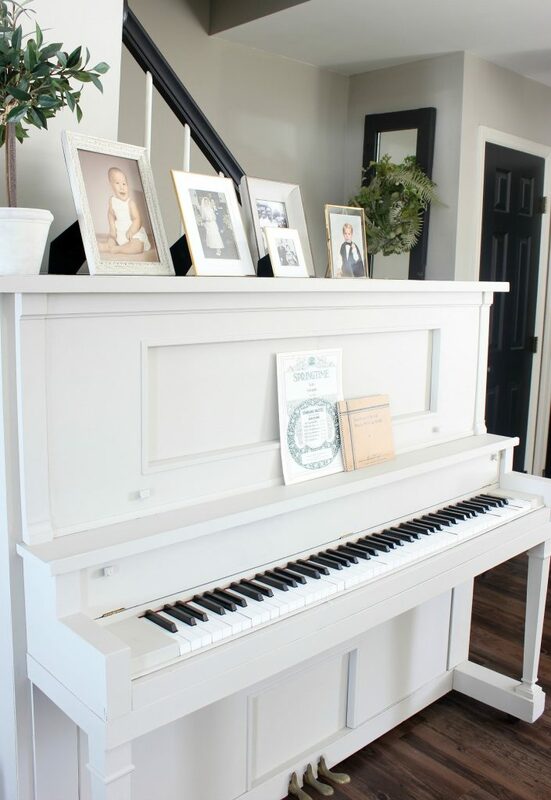 And, here’s a peek at something really new to my home that I haven’t even shared yet – a piano! This is another Craigslist find! It was FREE and it’s a player piano! And, it works! Of course, I gave it a little facelift with some paint and I’ll be sharing all about it next week! 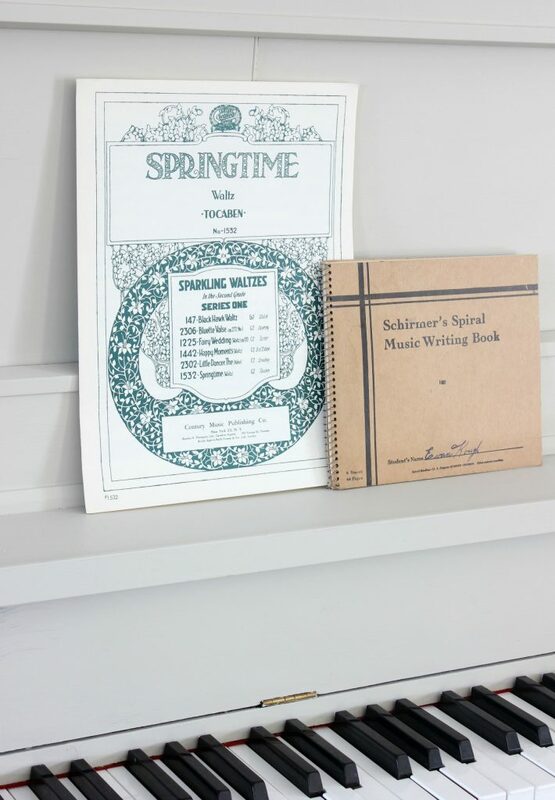 I have had this vintage Springtime sheet music in my stash for quite a while and the music writing book was my dad’s. Now, let’s head into the dining room and kitchen area of my home. I also tried to brighten up this space a bit and changed out the black clock, that was over my range hood, for this wood quilt art that I made last spring. For a simple table setting I used pages from a vintage song book as placemats. And, I used more pages to line the ironstone tureen of faux paperwhites. The adorable bunny napkins are from HomeGoods! And the glittery music sheet eggs are another DIY that you can find HERE. In the kitchen, we added a shelf over the kitchen cart and it will be nice to have the extra space to store things. For now, I added some seasonal spring accessories. And, here’s the view from my kitchen into the dining room. If you follow me regularly, I’m sure you notice that I changed out the mirror over the black dresser/buffet. 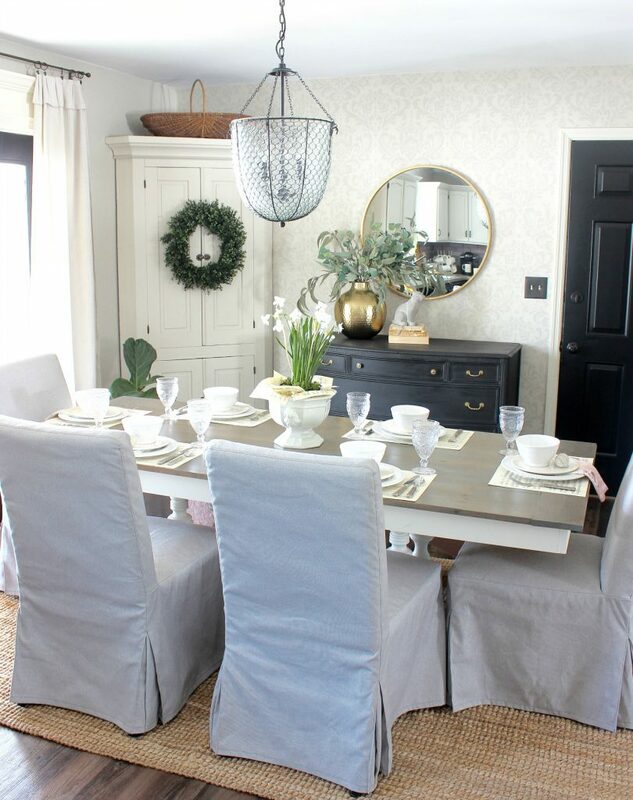 I love how this round mirror with brass rim ties in with the brass pulls of the buffet. Thanks so much for taking the time to visit me today for my 2018 Spring Home Tour! 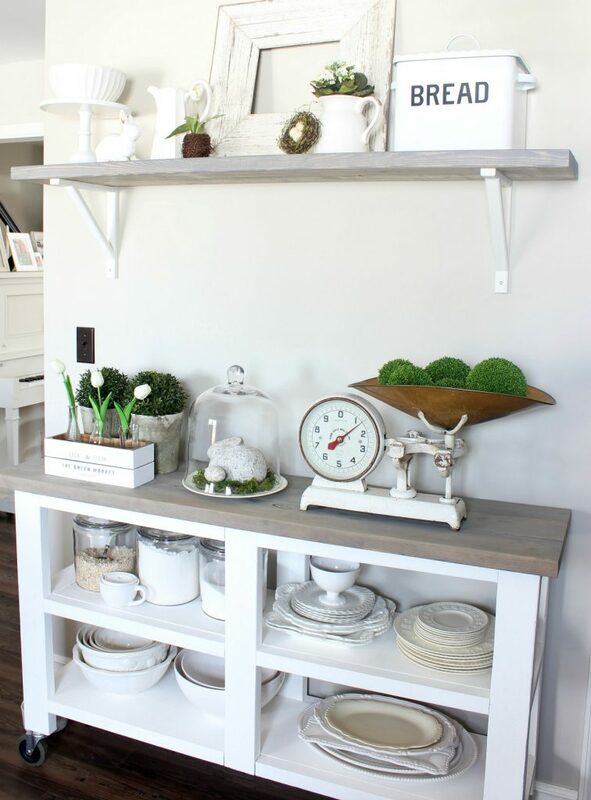 I hope I’ve inspired you with a few ideas to decorate your home for spring! Next up on today’s tour schedule is Thrifty and Chic! 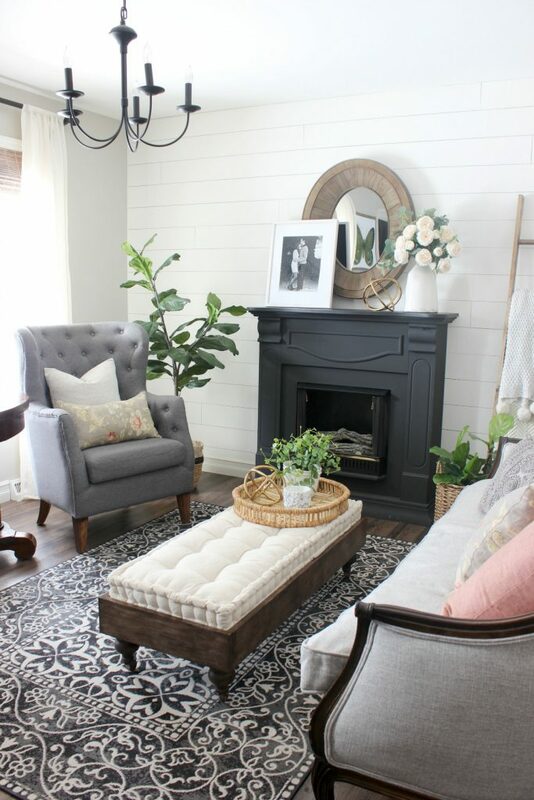 I love Alicia’s warm farmhouse style and know you will too! And, don’t forget to visit all of the fabulous tours from earlier this week by following the links below! Have a great weekend! I love it all, and that sofa is amazing. What a fantastic job you did. 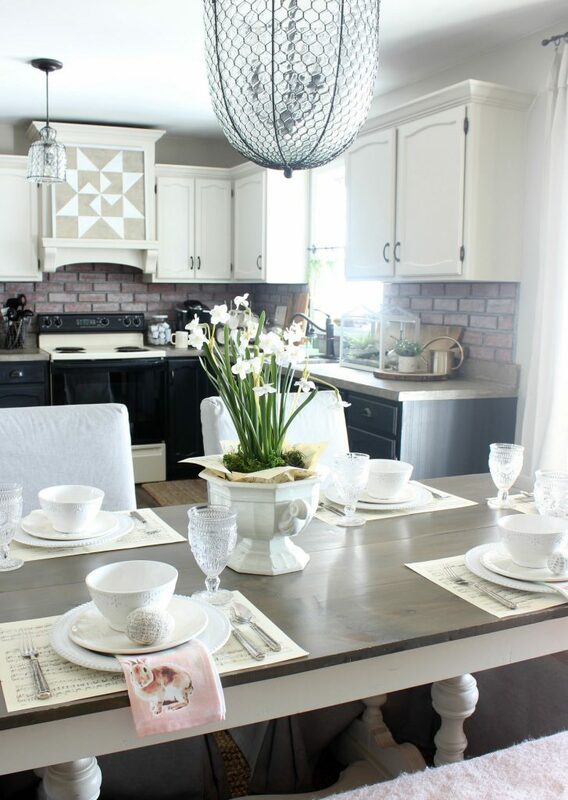 I really love the dining room too, so pretty and such a lovely tablesetting. Thanks so much for joining the tour, your home is gorgeous all dressed for Spring. You have outdone yourself, Doreen! I adore the butterfly print and your kitchen is completely charming. You did a beautiful job, Doreen! Son inviting, calm and restful. I always love your home tours, and the changes you made are really lovely. You are so talented! Thanks for the inspiration. doreen, love the butterfly. can’t wait to see your collection. i am looking for something for my screen porch. what a great score…player piano. i too just got a new piano that I haven’t shared, a gift from my mom. your home is always so bright and cozy despite your cool temps outside. happy spring. I love the look of your new sofa Doreen! And as always, I look forward to touring your beautiful home each season (love your IG feeds too)! As always so honored to share this home tour with you dear! Cheers! Love it all! But I am fixated on that amazing door between the windows. Where did you find that beauty? Did you paint? How is it attached to the wall? I. Must. Have. It. (or one similar)! Hi, Jennie! I found that amazing door at a local farm that had a sale and it was love at first sight! It is such a unique old door. I did paint it with Magnolia Paint Dutch Tulip – the palest peachy pink shade! Another great home tour. I always look forward to yours and they never disappoint! I love all of your touches. The sofa is amazing. Did you make the ottoman as well? Where did you get your curtains? I may try to add that this year. Ohhh I love it all as usual!! 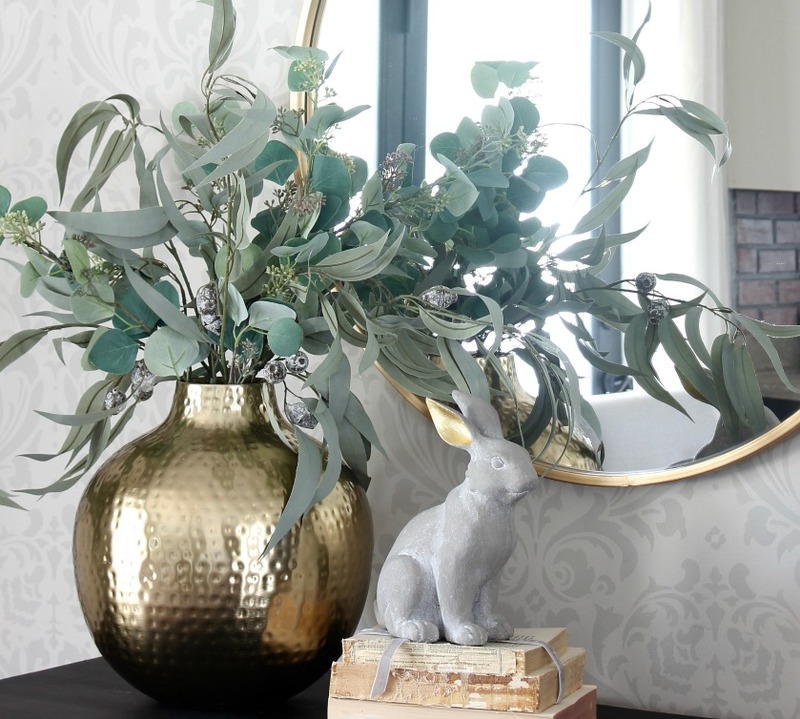 The whole look in the dining area is truly transformed with the mirror and brass chunky vase. The ears on the bunny are too cute!!! The living room does look fresh and airy. I like the new couch and how it has transformed your space completely. Your home is huge!! Room for a player piano!!! Delightful!! 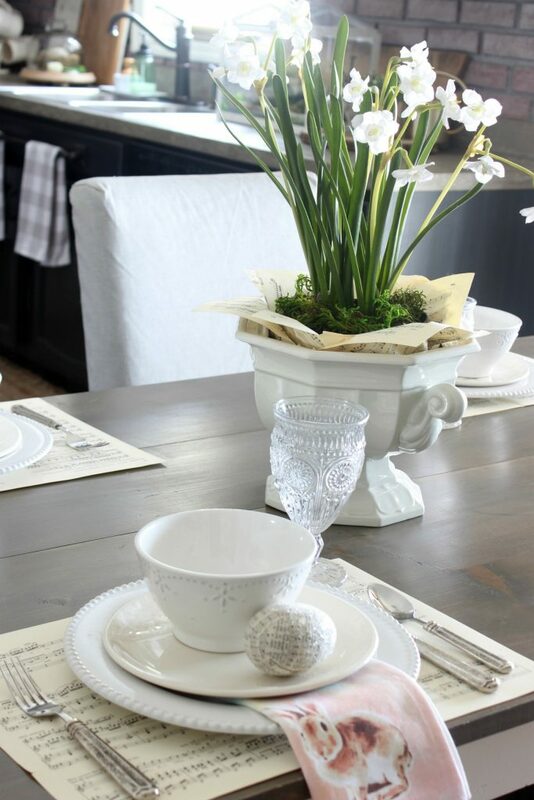 Everything ties together to create a wonderful space to welcome Spring!!! Hi, Gwen! I had to LOL when I read your comment because my house is anything but HUGE! But, it’s perfect for us right now! Thanks so much for your sweet comments!!! Oh Doreen, Upholstering a sofa it’s not easy, you’ve done such an incredible job! 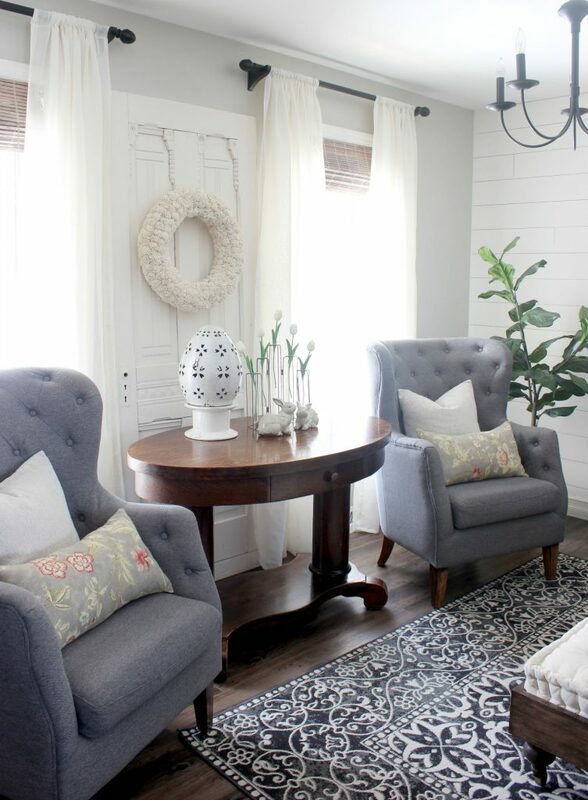 Love the fabric you used and those pillows go so well wit it. Now, that butterfly art is adorable. Love your home! would you mind telling me where you purchased your living room curtains? Can you tell us a anything about the beautiful mahogany table that holds your oversized egg? I have one just like it, without the knob. My father used it as a desk for his home practice when he saw clients. Would love to know the history behind yours. Lots of great spring inspiration here! As a music teacher, decorator and vintage collector I adore the spring sheet music on your piano and the sheet music placemats. I can’t wait to see what you come up with next week!